Cut to 2013. To celebrate his 60th year as Founder and Chairman, Graff has reproduced Leighton’s hair idea for an ad campaign featuring probably the most expensive hairdo ever – with a “cool half a billion dollars’ worth of Graff Diamonds.” The ad, featuring 22 of the best baubles is now running everywhere, like in The New York Times and Wall Street Journal Sunday Magazines, and on the cover of Leighton’s local magazine, Atlantic Avenue in Delray Beach, Florida. 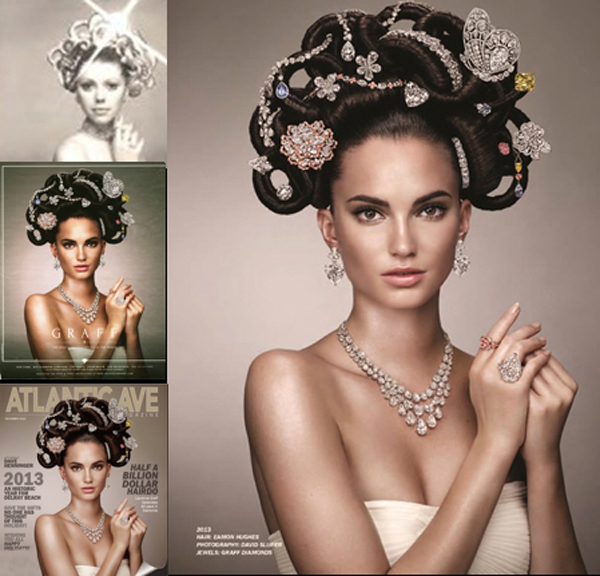 See the 2013 photo right, the Leighton 1970 version top left, the current 2013 ad left center, the December 2013 Avenue Magazine cover bottom left.